Quite a few readers have written me regarding Thai-style fruit dips saying how they wish there wasn’t any dried fish or fish sauce involved. Actually, the way the comments were worded is a little more interesting, a weird cross between disbelief and curiosity with a tiny, tiny tinge of disgust. I don’t blame them; I know how that feels. When I was invited to my first American thanksgiving dinner, I swallowed hard — and not in a good way — when I saw roasted turkey with gravy sitting between a pile of candied yams with broiled marshmallow topping and a quivering blob of fruit jelly called, “cranberry sauce.” I, of course, grew more accustomed to that combination and even came to like it. But, admittedly, the first encounter was pretty rough. Our view regarding what should and shouldn’t be is all conditioned by culture. Tart green mangoes and a sticky dip containing fish sauce, palm sugar, and dried shrimp together are to most Thai people what apple pie and vanilla ice cream are to most Americans. In other words, fish and fruits work for us. But if you don’t like it, there’s absolutely nothing wrong with that. 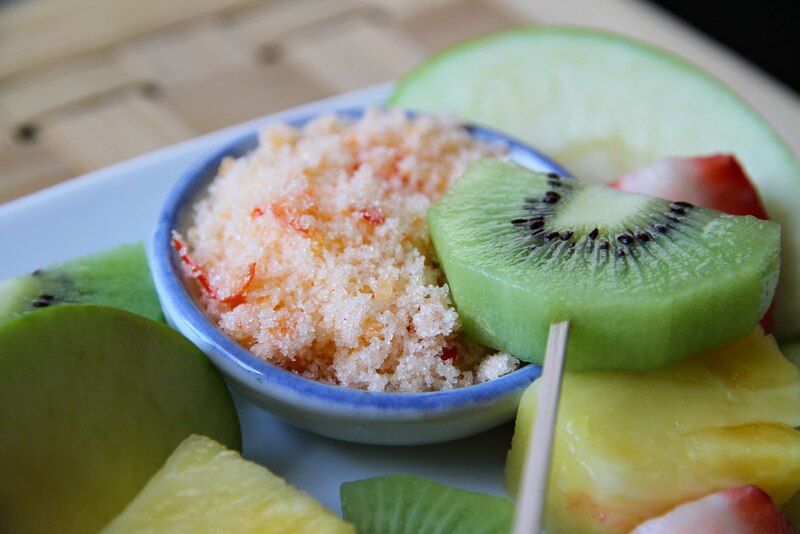 Besides, there are other Thai-style fruit dips that don’t have fish products in them. Please allow me to introduce to you the most common three that go very well with tart fruits. The first one, according to my experience, is by far the most common. Most fruit vendors will give you a little packet of this type of dip (prik kluea พริกเกลือ or prik kap kluea พริกกับเกลือ) with every purchase of fresh, prepared fruits. A more elaborate and costly dip like nampla wan (น้ำปลาหวาน) is usually not given for free, but fruit vendors tend to be more generous with this one. It’s made out of three ingredients: granulated sugar, salt, and fresh (almost always) red chilies. The chilies are pounded into a fine paste and blended with sugar and salt. The end result is this sweet-salty dip spiced and tinted by the pounded chilies. To make about half a cup, pound one or two (depending on your heat tolerance) red bird’s eye chilies in a mortar (you can also chop them up very finely), then add in 1/2 cup sugar and 2 teaspoons of salt, and blend well. The second one is another type of prik (kap) kleua which is almost as common as the first one. It’s made the same way with the same ingredients in the same ratio. Simply replace fresh chilies with maybe a teaspoon or two of dried red pepper flakes (ground up into a finer powder). 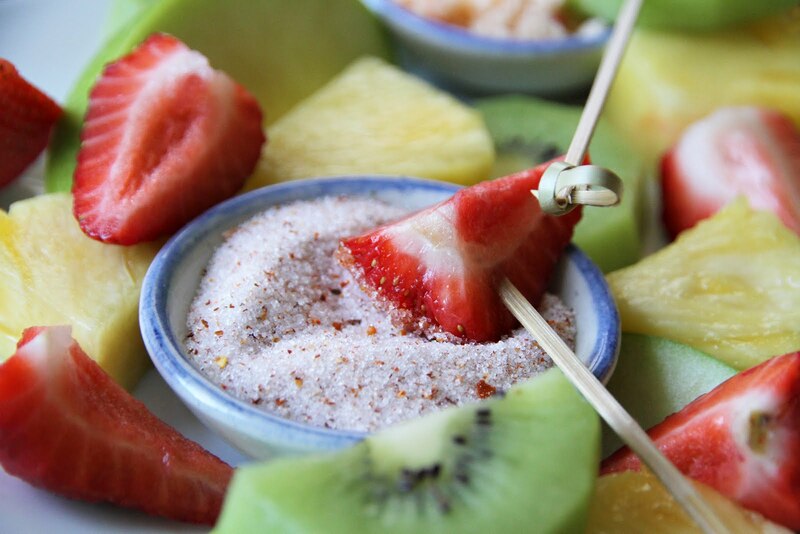 I actually prefer this type of dip, because I find that the smokiness of dried red pepper flakes works very well with fresh fruits. Try serving this dip with jicama, peeled and cut into sticks. I could snack on that all day. Then we have another one which is a simple palm sugar-based dip (which many people confuse with nampla wan). I don’t even know if it has an official name (does anyone know?). This type of dip is the least common of the three, and, from my experience, you’re most likely to see it at a guava (farang ฝรั่ง) stand. This could be because, being made of palm sugar, it’s more costly. Some fruit stands don’t even give this type of dip to you for free. Most of the time, fish sauce serves as the source of salinity in this sticky dip. However, unlike nampla wan which must contain nampla (fish sauce) by definition, this one allows the fish sauce-averse to get away with using salt. To make about a cup of this type of dip, put 180 grams (about a cup) of palm sugar (this type) with about 1/4 cup of plain water in a small pot and bring the mixture to a gentle boil over low heat. Be patient, and don’t use high heat. You just want to melt the palm sugar gently, not to caramelize it. Once the palm sugar is melted, add about 2 teaspoons of salt (more or less to taste) and one or two fresh red bird’s eye chilies which have been chopped finely or pounded into a fine paste in a mortar. Take the pot off the heat and let the dip cool. It will thicken up considerably, so be prepared to thin it out with a bit of water, if necessary. You want this dip to have the consistency of honey. 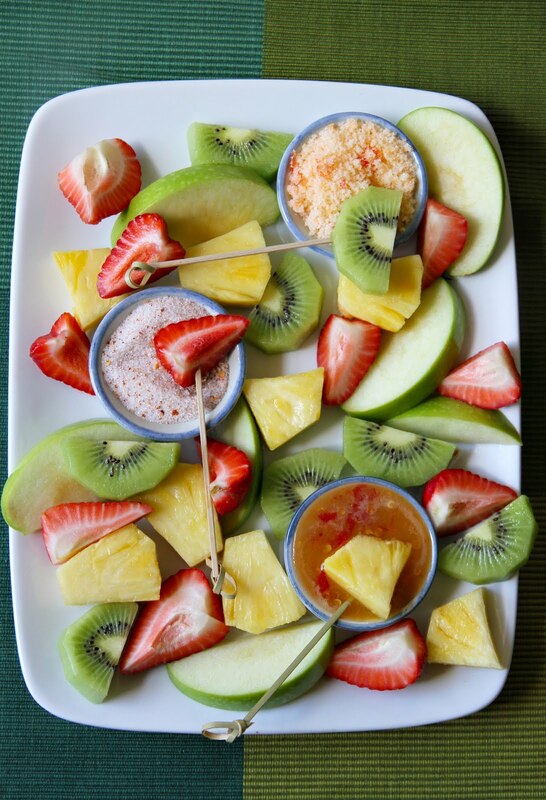 thank you so much for this post – I always loved the fruit dips in my stays in Thailand (espeacially with pineapple and guava). I will just try this in the next days and feel a little bit like in the stressts of Bangkok again. For those who enjoy the dried shrimp and fish sauce in nam-pla-wan fruit dip, I encourage you to move up to a more-advanced level and try Kapi-wan (กะปิหวาน). It is made from shrimp paste, usually eat with sour mango. Everyone, what she (Napat) said. Practically speaking, is there any difference between the rock-hard cakes of palm sugar and the stiff-but-scooopable, peanut-butter-texture stuff you can find in a jar? I mean, obviously one has more water than the other, so I’d expect I would have to adjust liquids to account for that, but since it’s so much easier to use (and I have a pretty easy time finding it), is there any reason not to use the jarred stuff? Nicole – Apart from the liquid issue which you’ve rightly recognized, the lozenge type palm sugar is the easiest to find and most practical to use outside of Thailand; hence the recommendation. The kind of palm sugar that is PB-like in consistency and scoopable, based on my experience, seems to be available only in Asia. Once it reaches the US shore, it invariably becomes hard as rock and not at all scoopable — impossible to get it out of the jar without bending your spoon. Please add a recipe for the fruit dips you mentioned that include fish sauce or dried fish. They sound intriguing and I would love to try them. Anon – Simply click on the underlined words “dried fish” and “fish sauce” and you’ll be led to the recipes for the dried fish dip and fish sauce-palm sugar dip respectively. They all sound so intriguing and delicious. I wonder at aversion to the fish and fruit combo. Many a good cerviche has mango, and other citrus thrown in. PS – Very glad you have the name/url ability back on. I realize that I am on the wrong thread and appologize, but I am trying to find a recipe for a curry. Red Curry or Panang or any other will be work. I remember reading on this site that you stated that you needed to add a recipe for curry, but I have never been able to find it. Please point me in the right direction. I tried to make a curry once and it turned out to be anything but a curry..Please help! JD – I have a few curry recipes on this site, but I’m assuming you’re looking specifically for a curry recipe that requires a curry paste made from scratch. Is that correct? I will accept anything. I have a jar of Thai Kitchen Red Curry Paste that I tried to use to make a Red Curry from a cookbook recipe but it did not turn out very well. At least it did not resemble anything I have ever had at a commercial establishment. I would like to be able to prepare the entire thing from scratch, I have a mortar, etc. and would certainly appreciate instructions on doing so, but also I would like to know how to use the curry paste I already have. I have a feeling that the instructions will be very similiar with the exception of using a commercial curry paste rather than making it. I am good at stir fries but everything else is a complete mystery. JD – I’ll get to a post on how to make curry paste from scratch eventually. The hardest part is not how to make it; it’s finding all the fresh ingredients. And I strongly believe that using commercial ready-made curry paste is better than making a curry paste from scratch with missing ingredients or poor substitutes. Based on your situation, I highly recommend that you get acquainted with making curry using commercial curry paste first then when you feel comfortable (3-4 pots of curry later), move on to making a paste from scratch, if you wish. To get you started, I highly recommend my post on easy Thai green curry which is a primer of sorts on how to use commercial curry paste, the differences between the brands, what a good curry looks like, etc. It also links to a recipe (on another site) for shrimp dumpling green curry. By the way, if you want to find recipes on this site, feel free to use the search box on the sidebar on the right hand side. If you type in “curry” you should get quite a few results. I feel bad that you have to wait for me to answer to a comment which sometimes takes a while. Alternatively, you can also browse the recipe index. I grew up in Singapore so such flavors are familiar to me. 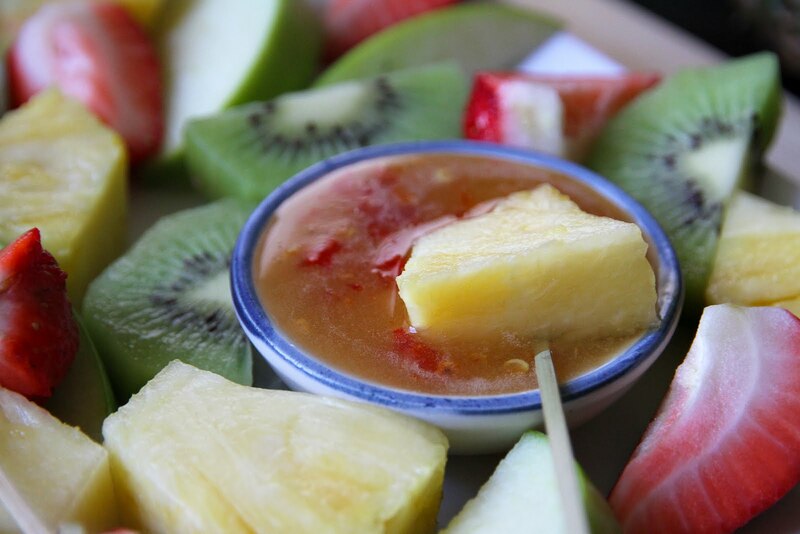 We also dip fresh pineapple in dark soya sauce with fresh chili! So so yummy!!!!! VB38 – I’ll have to try that. Maggi, here I come. these dips sound great, im uk based so will be trying these out in the next week or so…i think they will go down really well at a bbq! cheers, looking forward to future posts. How Strange i started yearning for these dips when eating some melon the other day and your post just appeared the next day.Thanks very much!! Hey, Leela – thanks for the reply. I must just be lucky – there are a couple of stores in my area (I’m in Arizona) that regularly carry the stuff in a jar. It’s stiff, but you can definitely get it out with a sturdy spoon. Maybe it’s the proximity to L.A., so it’s fresher? Anyway, thanks again. …well said and a very well written post! i couldn’t agree with you more! Totally agree with Napat and I must say that most Thai people (with advanced level) love to have green mango with Kapi-Wan which is make from shrimp paste. But it is one thing like durian….BAD SMELL! Very nice and tasty memories are coming back to me. Thank you a lot!!! I will try this at home very soon. Thanks you for the post. i love to eat these fruits dips, never miss its when travel to BKK..can anyone share the resepi for Kapi-wan, i really love Kapi-wan paste..